Unless stated, click on the thumbnails to view larger images. The Mystery Machine, Death Star, Dudbot, Minion, Y-Wing, Bionic Repair and Who Street models are for non commerical useage only. All the other files on this page are free for use in both commerical or non commerical images, projects, animations etc etc. If you wish to use any part of these files (excluding the mystery machine, deathstar, dudbot, pickup, minion and bionic repair) in commerical poser products please contact me. Can't download a file? Please let me know. Here's another freebie thats escaped from the dark recesses of my hard drive. This time the "Proof of Concept" Set for a product. 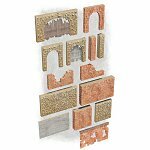 The original idea behind this one was a script (written in Perl By Kastaway) would create a series of prop walls, arches, columns and roofs. 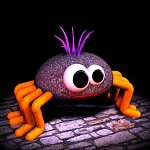 The really clever part was that the script would create meshes where each part had a random and unique pattern of modelled rocks or bricks. 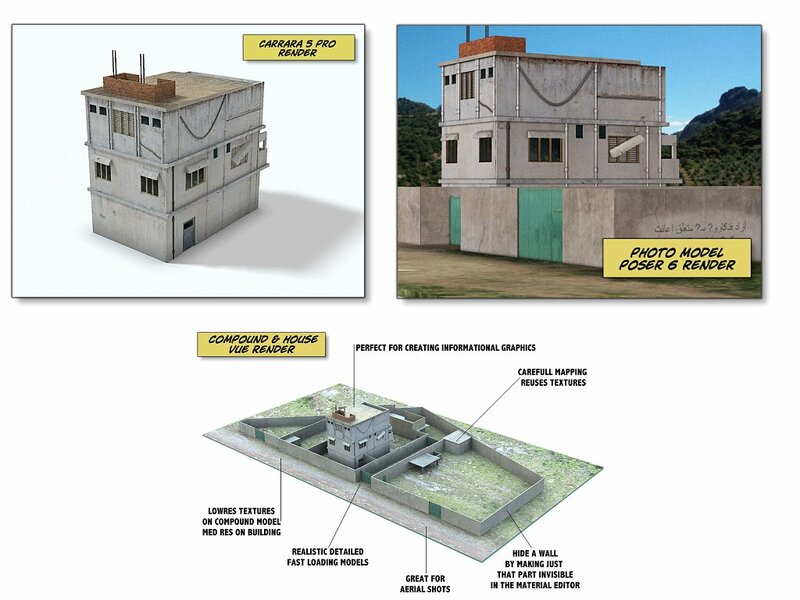 The second design aspect is each prop only has 2 material zones [walls/rock] or [mortar/brick], which reduces system load and allows the artist to easily apply high or low resolution textures (lo-res supplied). Which also gives the artist the abilty to make very quick changes. (RC-2) Ruined City 2: Sci-fi was meant to be the follow up for the popular Ruined City set. Much like the 1st city set, the idea was that most of the things in RC-2 would come in 2 flavours. One "clean" and one "trashed" model. But as 3d people know, sometimes projects just don't work out, things get consigned to a dusty corner of our hard drives and get forgotten about it. Which is what happened here, until by luck these models where re-discovered. Are you a wannabe dictator? Do you want to have more time for the fun stuff in life? Budge over Batbloke.. shift over SpideyGuy... theres a new SuperHero in town ..Well his car! Yep thats right inspired by the 60's TV series Batman, here's the worlds 1st BatMobile for Chihuahuas. Avaliable as both a real world model for dogs and a 3D poser prop. It's hard work being an international jetsetter, so keep yourself germ free and happy with this handy set of bucket (with holes) and bed. Please note you'll need to supply your own tissues and liquids. 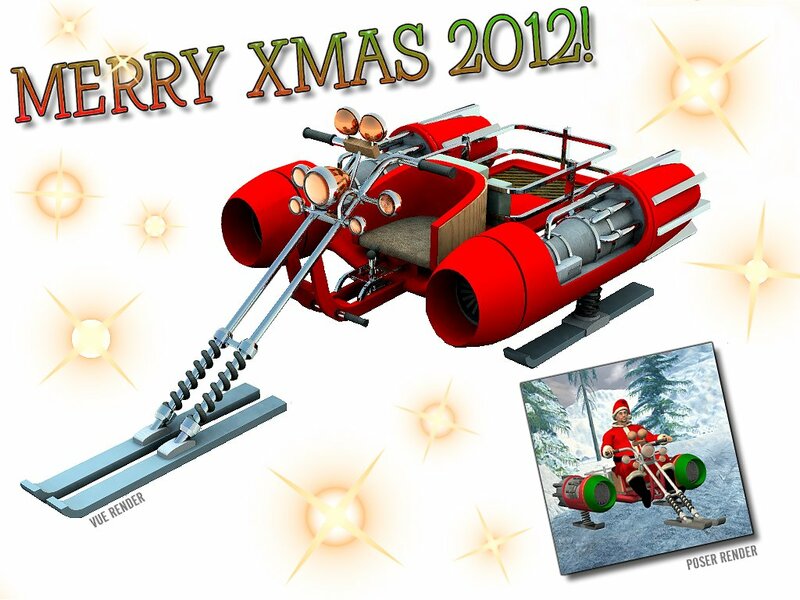 The slightly delayed 2016 Christmas/New Year Freebie, the Santa Scooter. 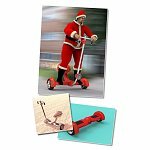 It's not just for xmas either, this model is suitable for all year round use and comes with a seperate hoverboard version. 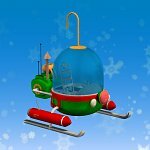 This one climbed up a water spout and refused to come out until he'd had his mince pies, but despite the wait, he's still great fun for your toon scenes. A 12 Page A4 booklet originally created for a Art Gallery workshop. This briefly covers 3D to 2D conversion as well as featuring loads of ideas and traditional modelling tips. Very simple catwalk model made for Blackbirdx61 in his thread over at R'osity. All the details are on the download page. Perfect for your steampunk aviators, a rather nifty pair of highly detailed googles. Well shiny! It's darn hard work being a professional forumite, so to make sure those uneducated plebs recognise your greatness I've created some new hardware to help you. A quiet place to eat doughnuts? You decide with this model inspired by the towers seen in New York and other US cities. Includes an Armed Robbin - with gun, swag bag and mean looking attuide. Plus a plain traditional tatty tinplate style Robbin. You'll never see that video in the same way again! For when you really gotta go ...and fast ....you need a racing toilet! Breakfast with a bad attiude! Static poser prop. Plain toast texture and instructions for changing the face with just 1 font are also included. 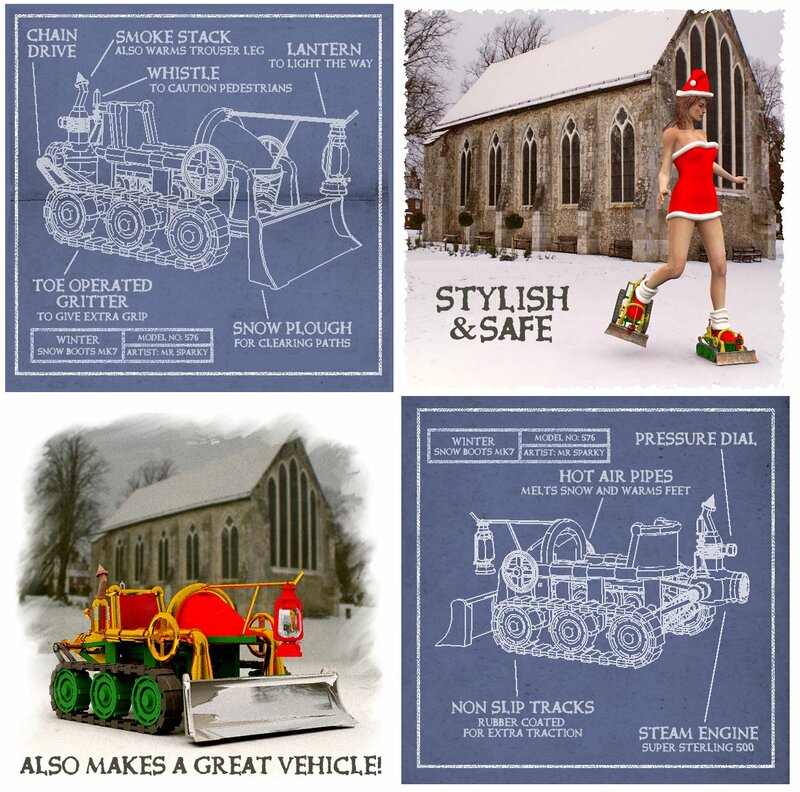 10 Assorted designs for your festive scenes. 8 are standard size, 1 has a semi transparent gel and 1 is slighty taller. All the cards have 100% modelled cutouts not transmaps. 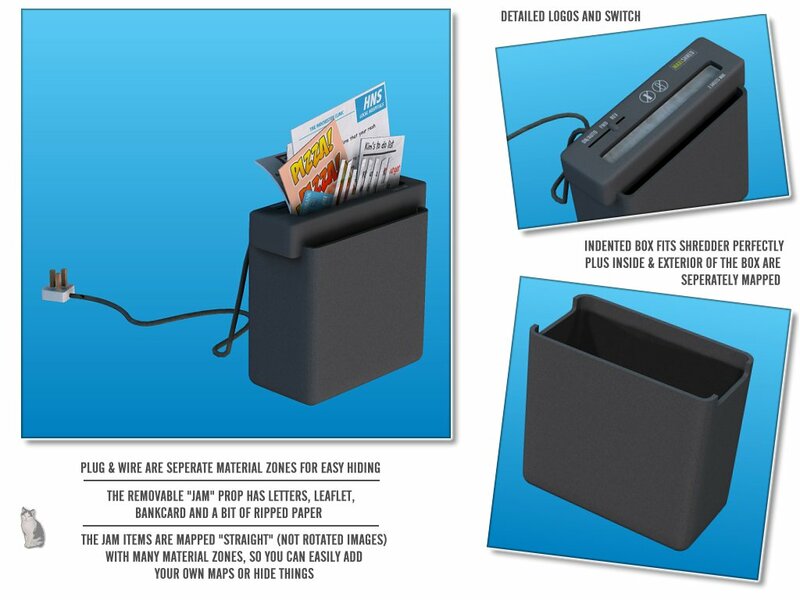 Instructions for making your own gels and card templates are also included. 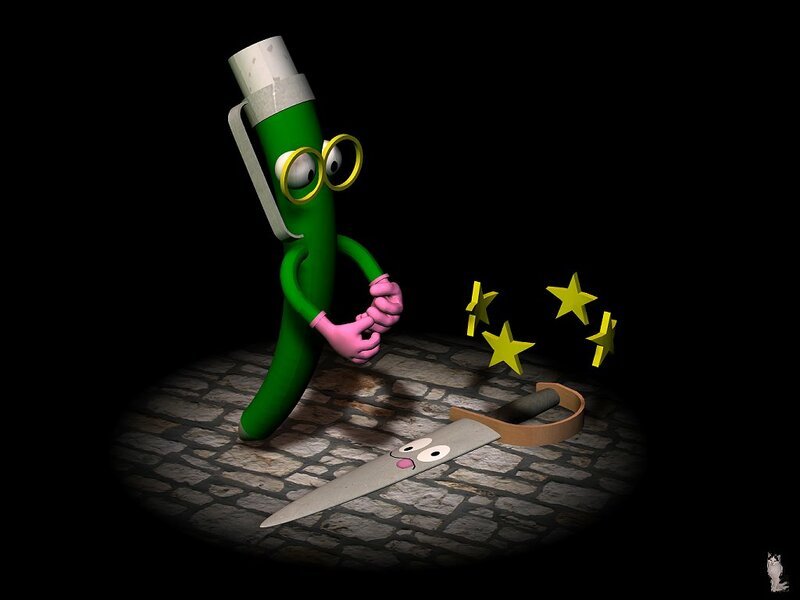 More silliness for Halloween - 4 OddBod models - perfect for fleshing out your toon scenes. Inspired by one of those toys that you lick and it springs up, usually when you're licking the rubber base, heres Mr Sparky's freebie for Halloween 2013 - the Tremblin' Terrors! This freebie contains both a free sci-fi set and a way that you can create your own hires 4K style images. So no need to spend 4 Grand on a new telly! A highly detailed model of a steampunk computer with easily edited labels that turn it into a Fun Red Tape Generator. Comes in 5 parts... One large computer and 4 seperate units. Inspired by the type of protective headgear used by tank drivers and on aircraft carrier, heres a sci-fi styled helmet. 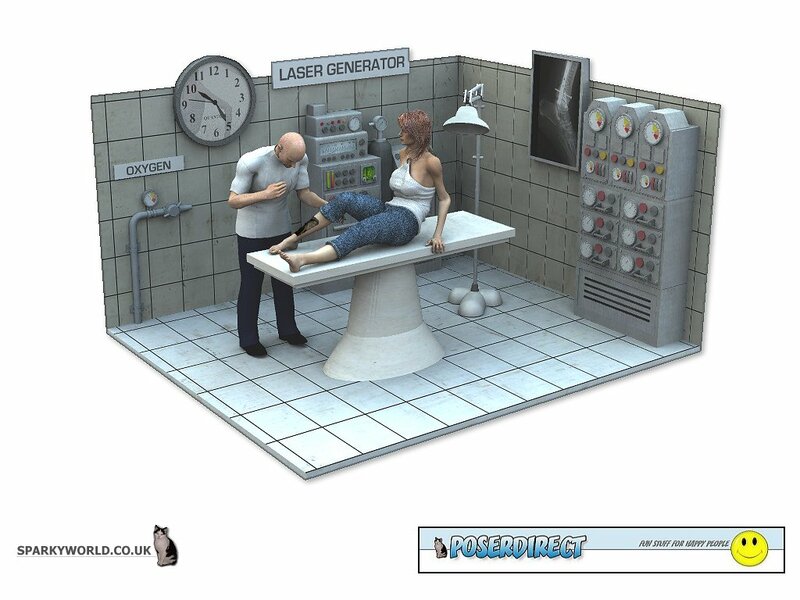 Poser Prop .PP2 that works with all figures. Ever needed to apply a Kitler Katerpillar to your Kitty Katt? A small factory unit as found on most industrial estates. Has opening/closing small front door, working roller-door show/hide poses for the footpath area, and easily changeable signage. The most acurate female figure ever...kind off..well actually not really. However it's still free and great fun! When one has a royal sprog, one needs the best that money can buy. But for you it's free! The eco friendly way to enjoy your toast and get your housework done. SWAT Gear Freebie Release for July 1st 2013. 1 Protective Riot Shield in 2 flavours. SWAT and Police. Inspired by an image posted by RTC-Spanky in a 3d forum, heres an incredibly detailed poser model of an old computer. All the dials and knobs have been modelled so this model is perfect for close up shots. Once upon a time, in a era before apps, everything had it's place. Where men in white coats earnstly smoked pipes and nerds where safely locked up in garages. Lived ... the Super Computer! A small poser homage to the classic British kid's card game of the 1970/80's "Top Trumps". You can take the lid off, deal the 22 cards and actually play the game! As well as the deckchair model, this download contains some other fun stuff. 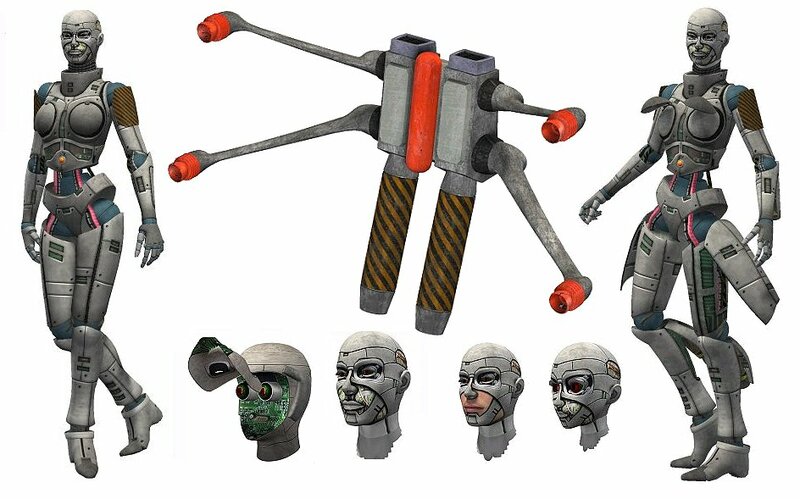 Two models, a head based security cam with missile and a standalone floating droid. These are so incredibly detailed and useable in various ways they have their own special page. A home/office desktop shredder complete with modelled "paper jam", wire and plug. The "jam" can be removed, shredder is movable and the plug & wire hidden. 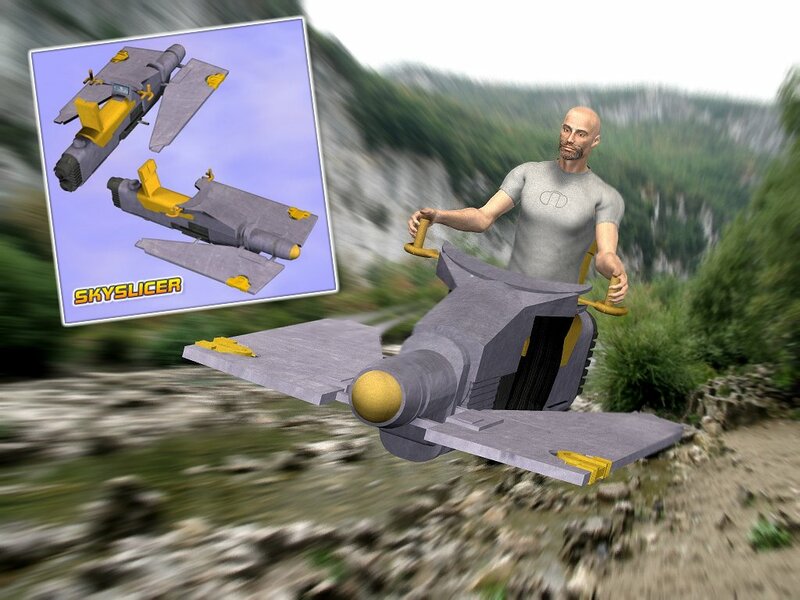 This extra freebie is the model as featured in my Aprils Fool joke 2013. The readme contains additional info. Contains the typical type of small stands you'd find at exhibitions. 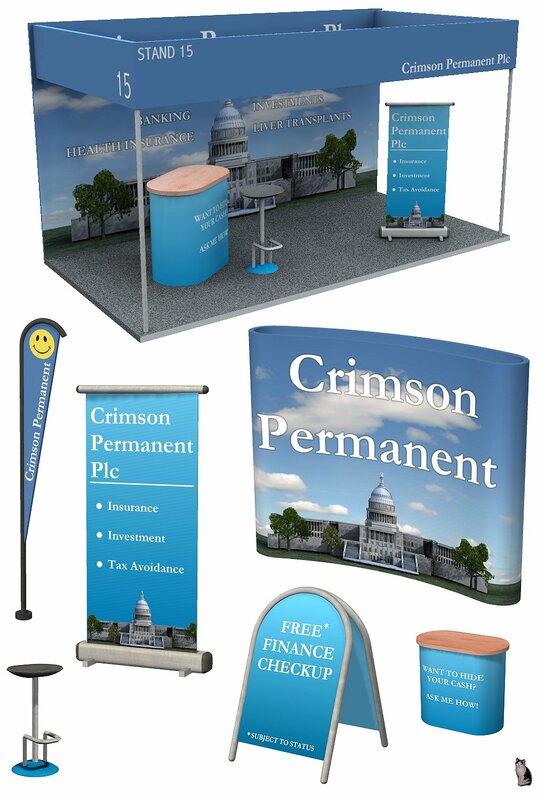 Plus some thingys like banners and boards you'd see in shopping malls, airports and on the high street. After removing the box, you'll be able to enjoy a lovely mockchoc egg. Made with free range polygons, it's gluten free, nut free, fat free and suitable for vegans. Plus contained within is a small fun gift. 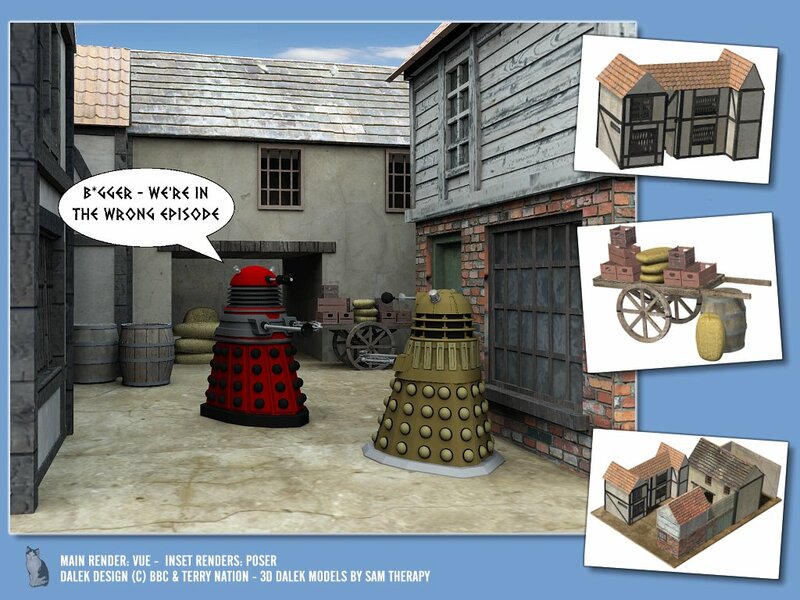 For a change heres a fan art model, a medievial street scene from Dr Who. Complete with a few extra props to add details to your renders. Click the thumbnail to see whats included. BTW - Non commerical useage only obviously! My biggest ever freebie release to date is a complete toon train set with a train, rolling stock and a massive variety of accessories. In fact just over 30 parts, so this model has it's own unique page, where you can see everything in the set and download it. It's hard work being a politician, banker or CEO. All that running around kicking people out of wheelchairs and making millions in bonuses, can make one tired. But don't worry this comfy seat will help. 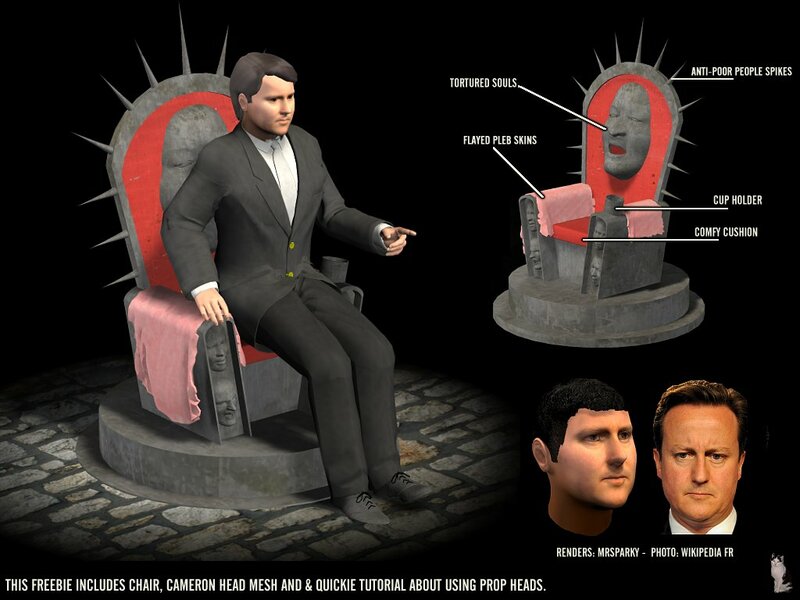 Plus theres a politicans head - sorry only virtual:) - and a simple tutorial (.PDF) for new users showing how to replace Poser heads with prop heads. 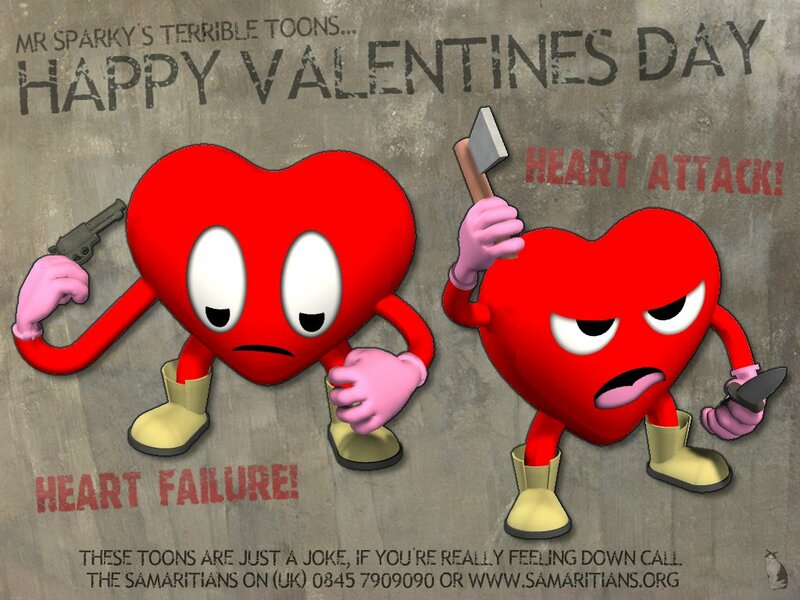 2 slighlty tasteless, but very silly, cartoon heart models in static Poser prop (.PP2) Format. Theres Heart Attack - a really crazy one with axe and knife. Plus Heart Failure - one thats had too much. Whats automatic..systematic..hydromatic ? The warped wheelies of course! 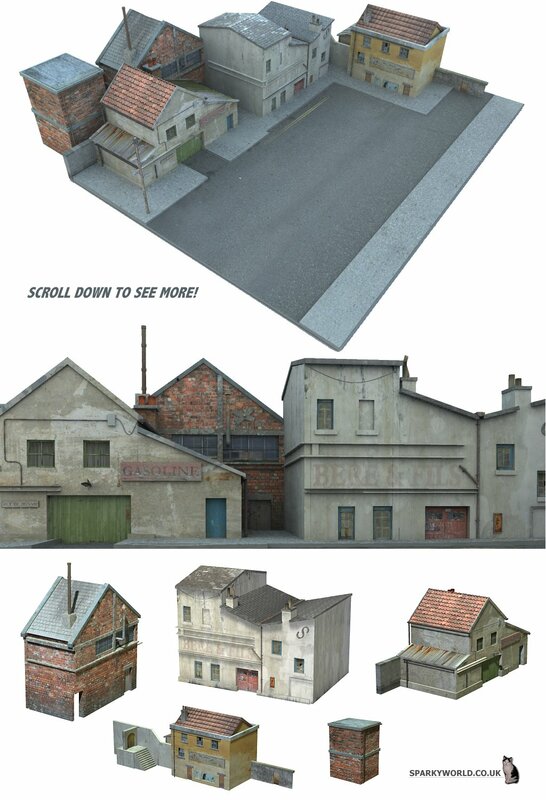 Also features the Simple Street & Motorway props. 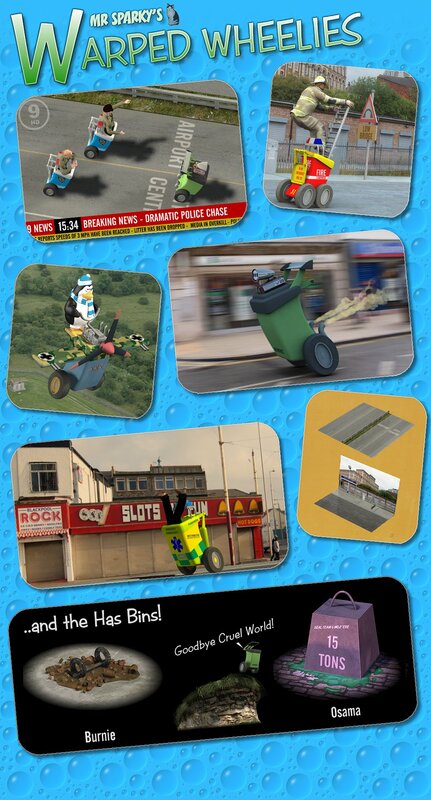 Plus theres the "Has Bins", for when even wheelies bins find it all too much :) Including Burnie and the 15 Ton Weight. Click the thumbnail to view them in action, you won't regret it! Created by Chris Schell, this cool free figure has been influenced by many classic artists and movies. As well as getting a bruiser of a biro, your freebie also comes with a knocked out sword and spinny stars. Bad town signs is a Poser prop representing the entrance to Hell. 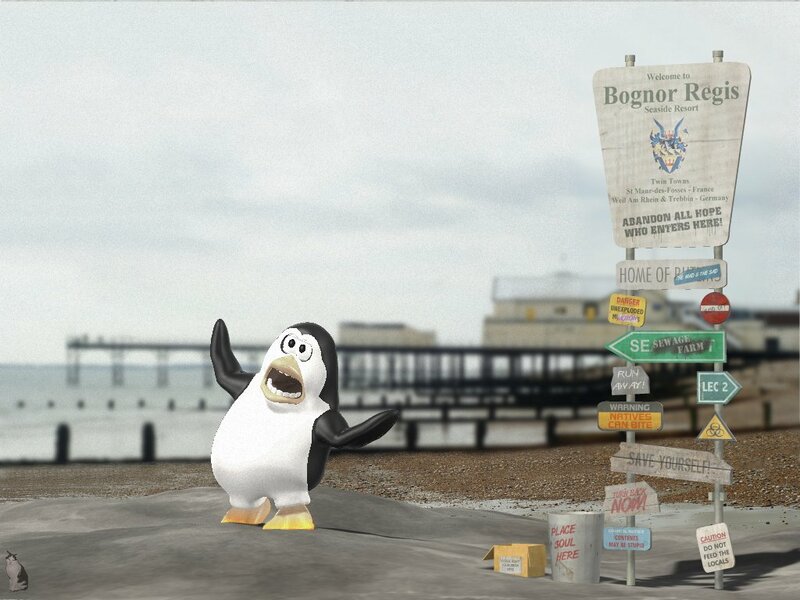 Aka the A259 into Bognor, or more whats more commonly called Satans bottom, after he's eaten a really bad vindaloo. Inspired by Ron Liesman's cartoons and way too much caffiene. From the genus "cameronrobuspoorus", Pete comes completely tooled up with bovver boots, a shooter, knife, club and broken wine bottle. 6 Models included. Q. 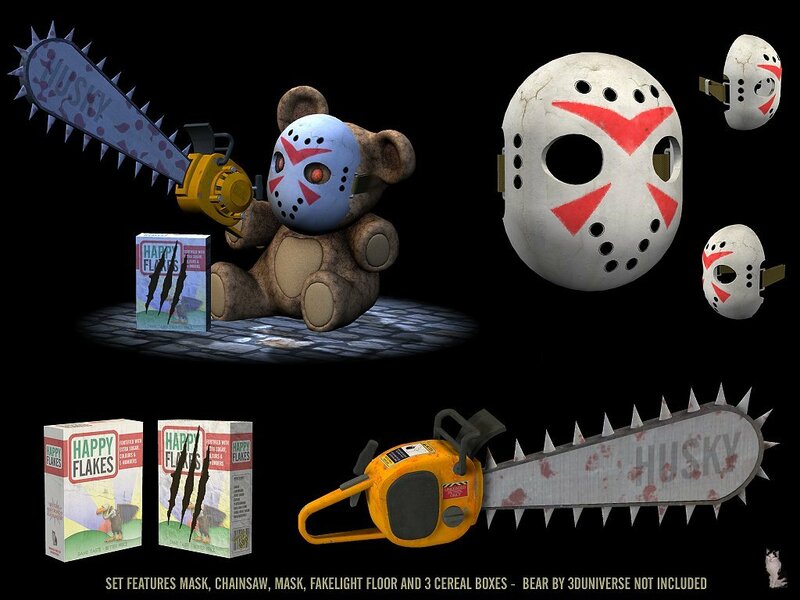 What do you call a cornflake hating teddy bear armed with a chainsaw? Created as an extra fun bonus for the DSA January Contest: Scream. Goodies as per the big picture (sans bear) plus the really usefull FakeLightFloor prop. Ever wondered what really causes global warming? Meet Smokin' Sid, the snowman with attuide! 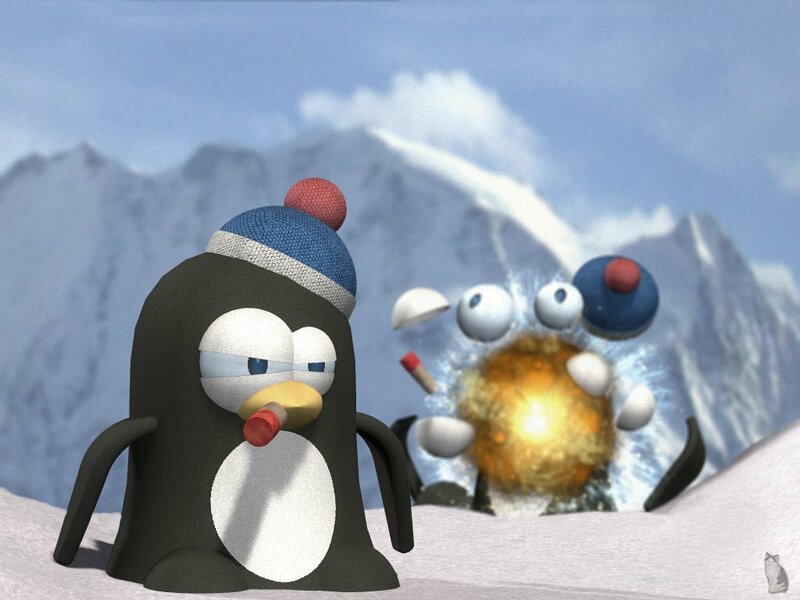 With flame thrower that fires recycled polar bear farts. 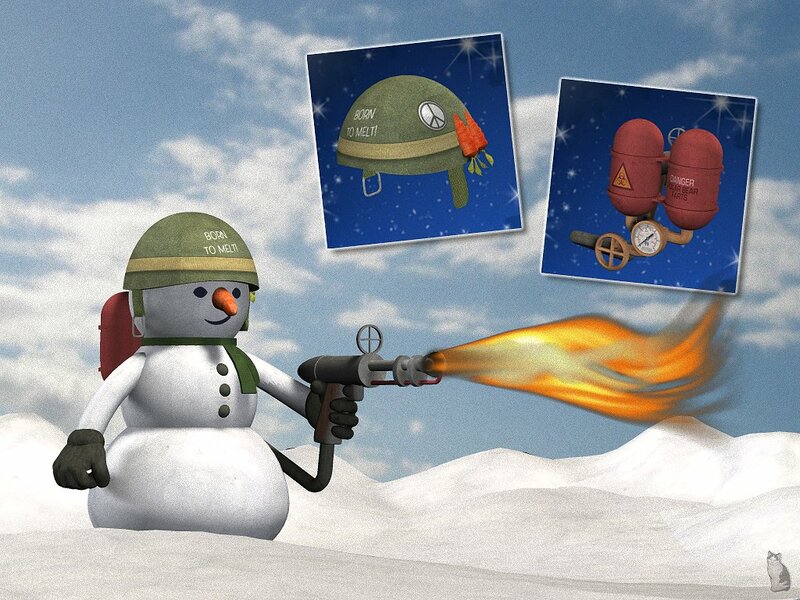 Plus helmet in the style of "Full Metal Jacket" with badge and spare carrot noses. 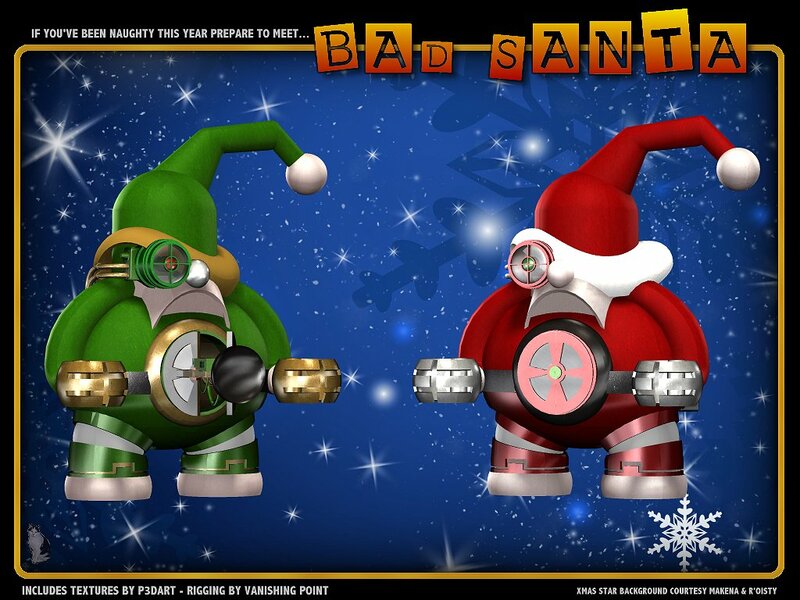 If you've been naughty this year, expect a visit from Bad Santa. He pinches xmas pressies from baddies using his tummy sucker, hides them in his copious belly and only gives them back when someone is good. 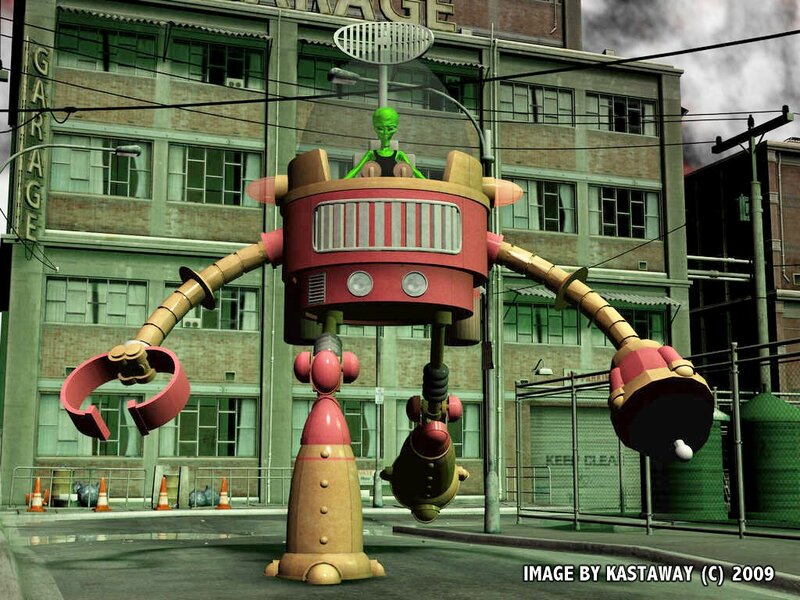 With rigging by VP and 2 festive shiny colour texture sets created by P3d-Art. Obviously non commerical/fan art useage only. An extra freebie for Halloween 2012, heres a slime shake, murder burger and bone fries for your monsters to enjoy. 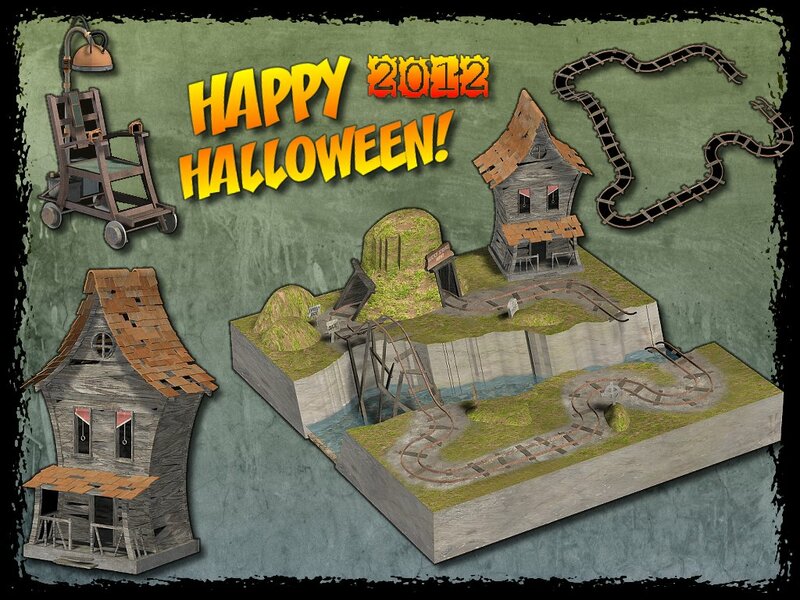 This years Halloween Freebie is now avaliable. 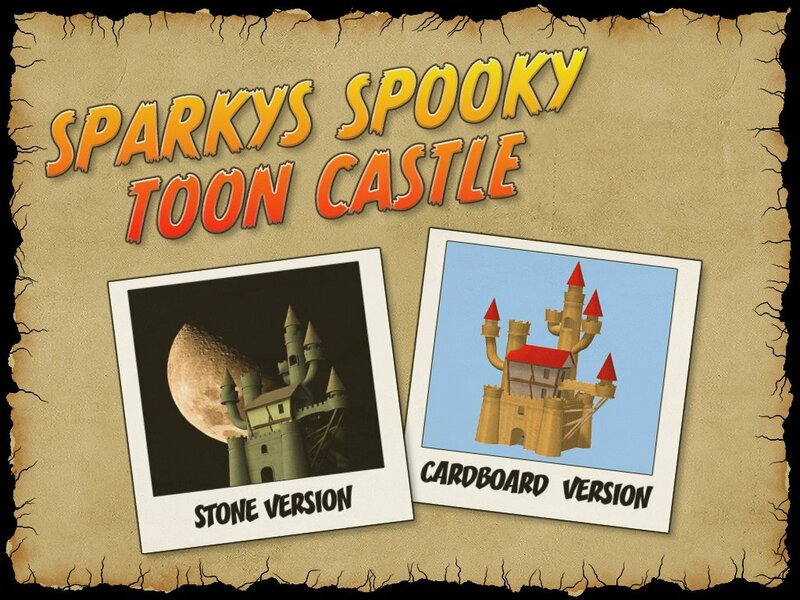 Features an electric chair, track for the chair, witches house and a preset with other fun bits. 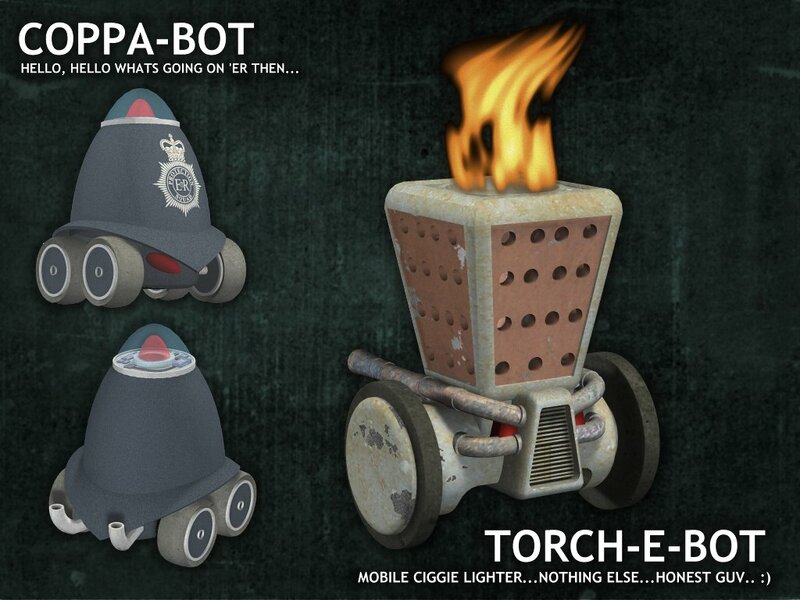 2 Bots that's got nothing at all to do with some minor coporate event:) The Coppa-Bot that protects the Torch-E-Bot (a large mobile ciggy lighter) from naughty people. 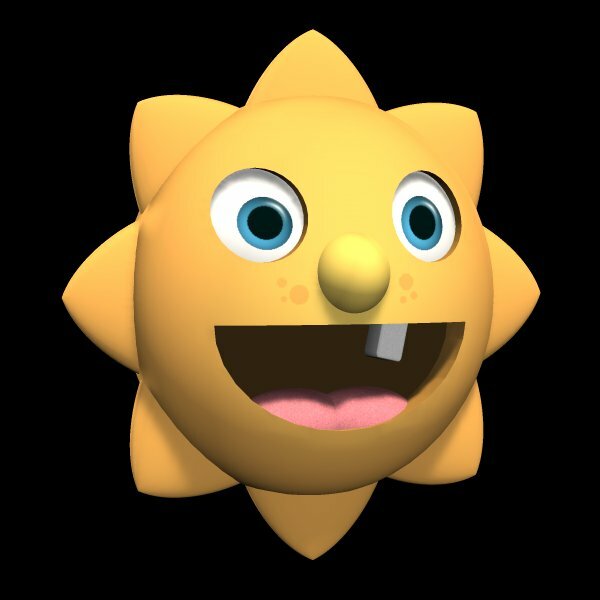 Nothing deep or profound here, it's a very large happy smiling cartoon sun prop - so smile and enjoy it! Inspired by the classic MPC plastic model kit, from the 1970's TV series "The Bionic Woman", here's a small freebie set of a operating theatre styled room. Contains a fully assembled room set with 2 "computers", lamp and operating table. Plus standalone versions of the computers, lamp, empty room and table. 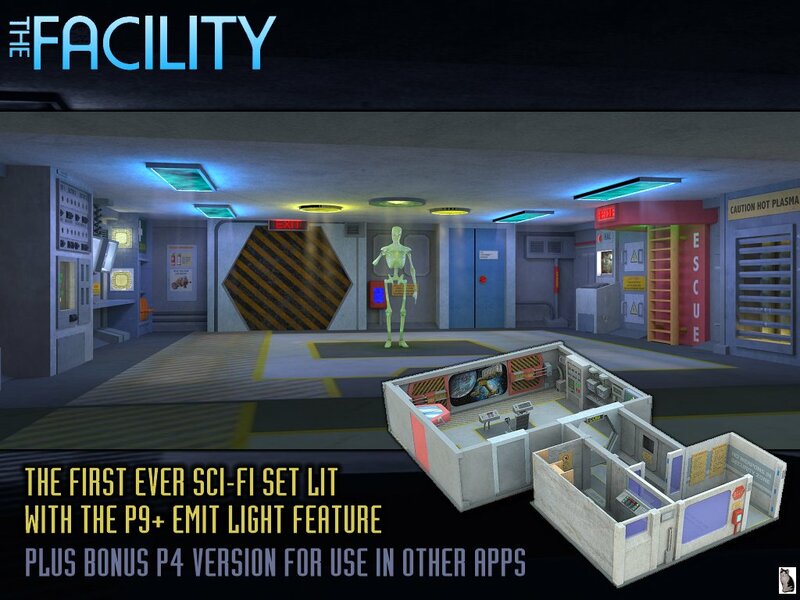 With lights created by seachnasaigh (most meshes by me), the Facility is the worlds first sci-fi set to use the new "mesh as light" feature for Poser 9 and higher. .PP2 format with an extra P9 .PZ3 scene with everything loaded and ready to rock and roll. Plus full instructions and templates. Also included is an alternate P4 based version, PP2/CR2 plus extra sections, which works great in other apps including studio, vue etc etc. An easter egg box which contains a free mystery fun freebie. Simply follow the easy to use instructions in the read me and enjoy! Inspired by the title sequence of movies made by the Rank Organisation. Heres a big gong, with 2 textures, templates, M3 starter pose and gong-donger. 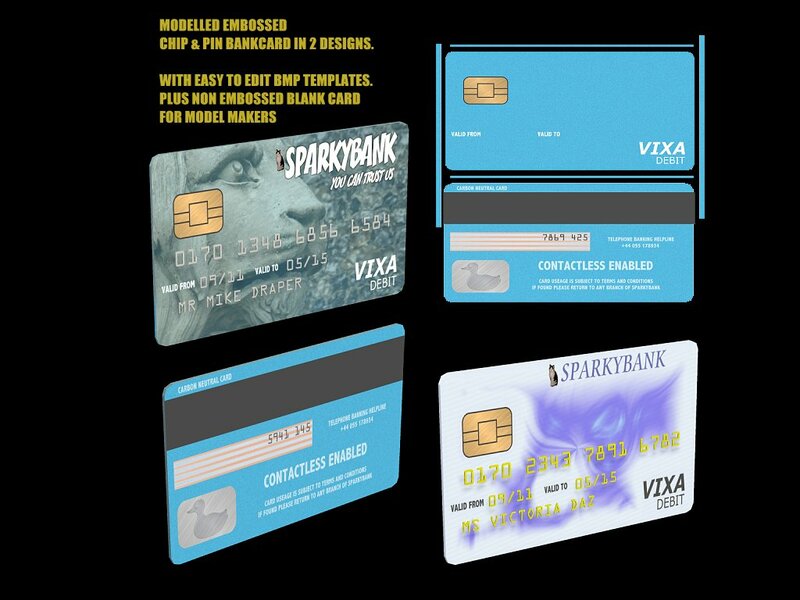 Here's some bank cards for Mike and Viki. .PP2 format, with modelled embossed lettering, .BMP textures, template. Plus if you make models theres also an extra non-embossed free resource card mesh. Another guest freebie by Chris Schell. Based upon on the movie GunHed (Ganheddo), heres a highly detailed transformable Tank/Walker packed with weapons and stacks of working detail. Please note: Chris's licence terms are different from other items here and as with any fan-arts stuff is for non commerical useage only. No large image avaliable. No large image available for this freebie. This is the goodie mentioned in "Mr Sparkys Money Saving Tips & Freebies". 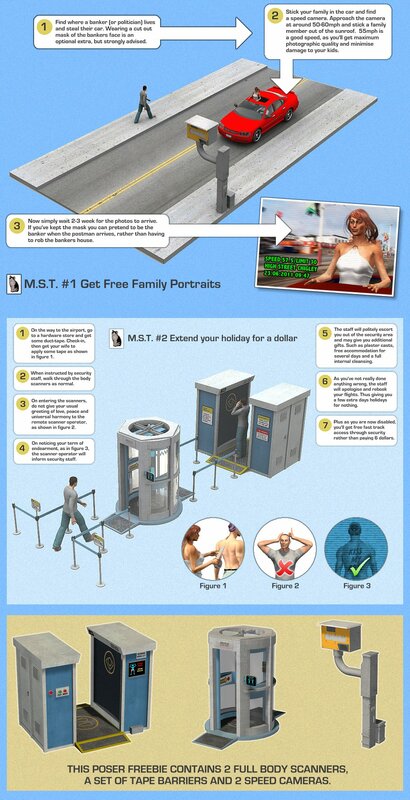 It has 2 speed cameras (1 alternate), 2 types of full body airport security scanners and a set of tape barriers. Plus theres some very silly tips in the zip and large image. Heres the second part of the Robo Navity. This part features the JoBot, MaryBot and the BabyBot As usual check-out the sample large image and readme. Heres the 1st part of the Robo Navity. 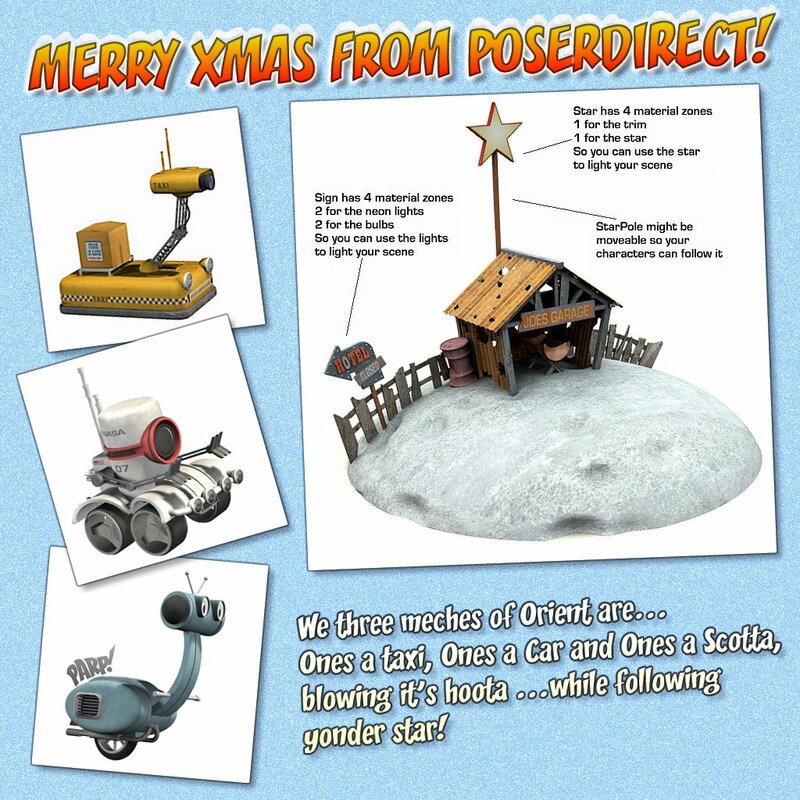 This part features the Nativity Base and the 3 Wise Mechs. Plus if you want an extra smile, please read the documentation in the zip. 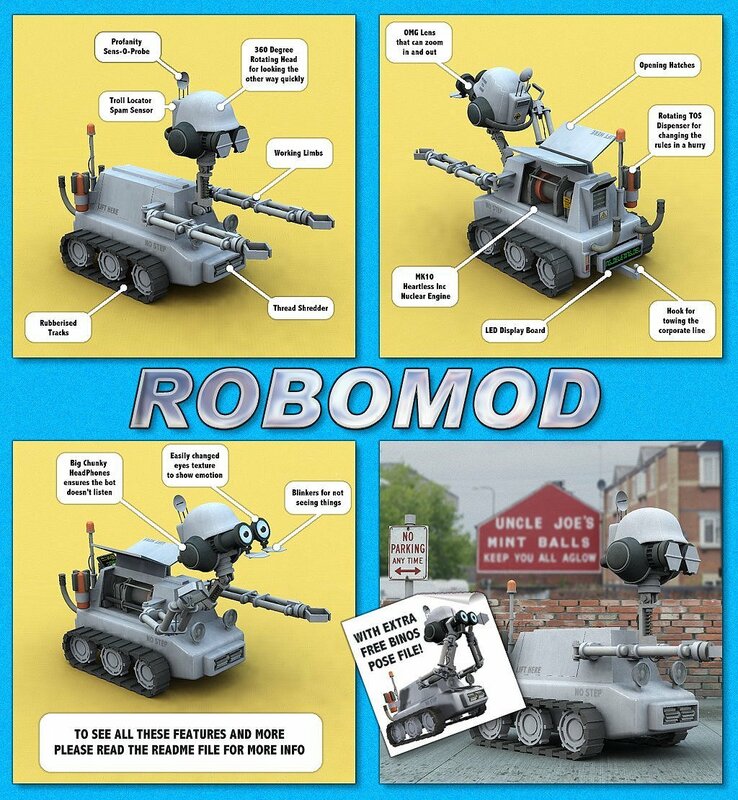 The Robo Mod is a great fun little character who's packed with working features and details. For all the into you need on this, check out the readme in the zipfile and the large image. 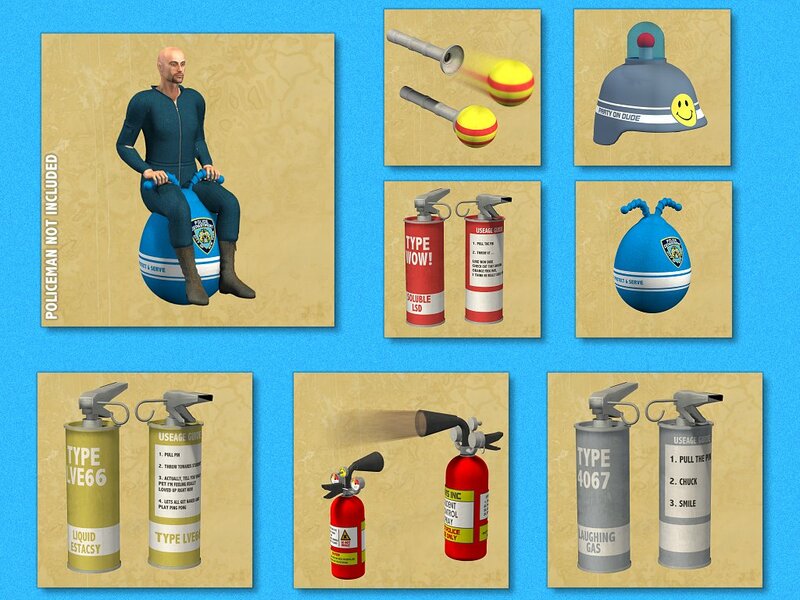 Control 99% of your poser people with this handy riot gear pack, including the CoppaHoppa, Beer Sprayer, Helmet, BB Launcher and Happy Gas cans. Also includes a classic 1960's style orange hoppa texture. To see the model in all it's silliness, click the little piccy. 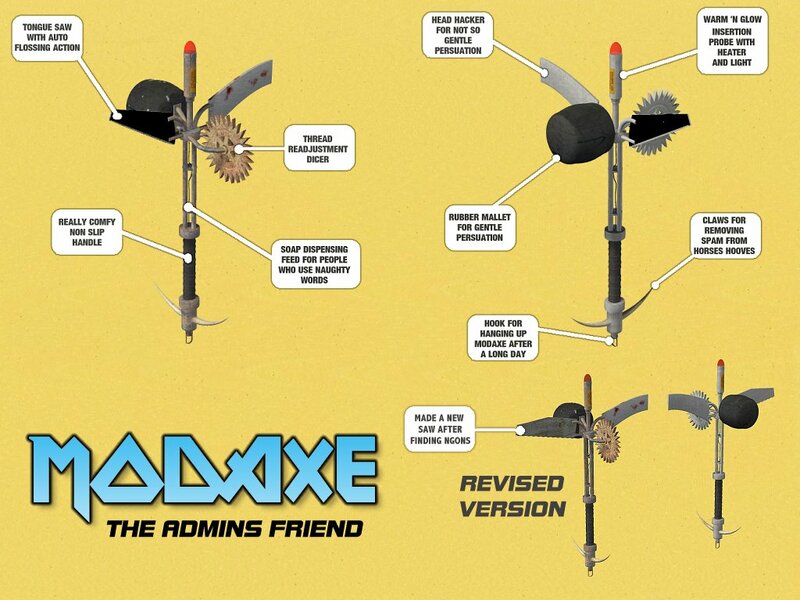 The ModAxe is a very silly weapon designed primarily for forum crowd control. It comes in 2 flavours, clean and dirty. 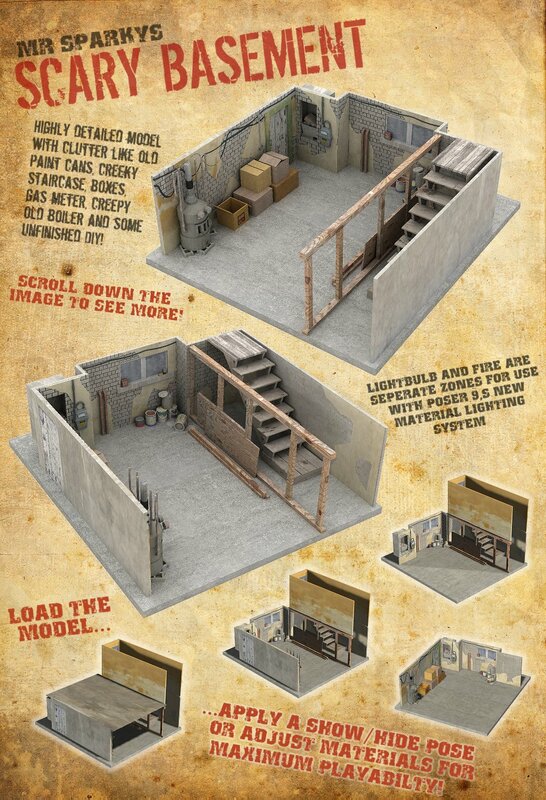 Here's an incredibly detailed basement model for your scenes, perfect for halloween and horror, or even everyday stuff. Includes junk, show/hide sectional poses and a read me file with loads of useage tips. To learn more about this great freebie, just click on the thumbnail. Inspired by the Skycutter from the TV cartoon show Thundercats, here is a small flying vehicle, with 1 texture set and a (starter) M3 rider pose. 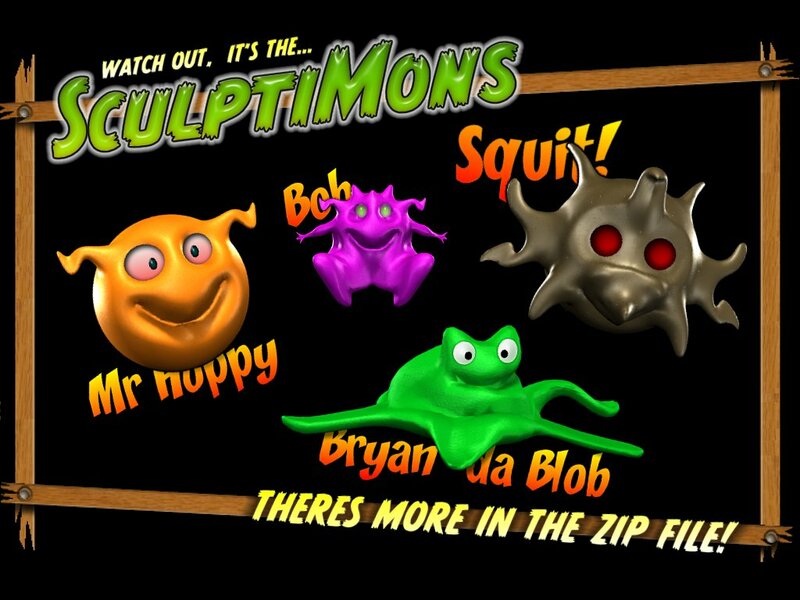 8 fun little critters made with Sculptris. These are NOT poser ready models, but mapped OBJs. The idea is you import, add colourful shaders, postwork some eyes and have some creative silly fun! 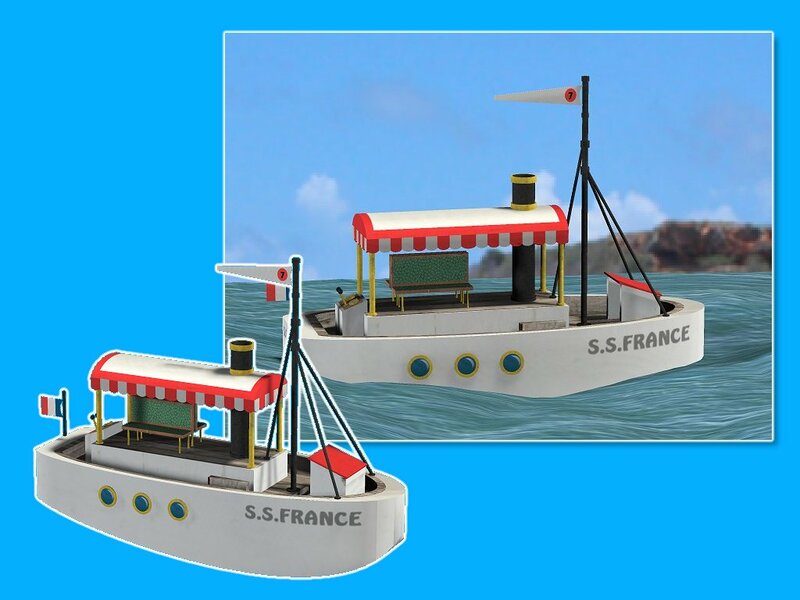 A fun cartoon style boat (PP2 poser prop) for your scenes. Includes 1 texture set (1024x1024 maps) and templates. Thanks to France for suggesting this model! Inspired by a childhood board game, and watching too many Tom and Jerry cartoons, you can now solve the worlds economic problem with this incredibly silly mad machine. Click on the thumbnail to see how this works. I'm pleased to announce that the amazing Haunted House freebie, complete with furniture, made for the Halloween contest at DreamSlayerGraphics is now avaliable to download directly from my store site. A small fun 'toon style castle in 2 blood curdling flavours. Stone and cardboard (thanks to France for that idea!). Poser PP2 format. Designed for use as a back ground prop. 512x512 mapping. Created by Kastaway, here are some "bolt-ons" for which allows an artist to add damage, or to spherise, MrSparky's Heavy Duty Sci-fi truck, Overlander and Cog Bike freebie and VP's C55 aircraft. IMPORTANT: This zip does NOT contain the original models or any external OBJ's. You'll need to install the freebie/products before using this. 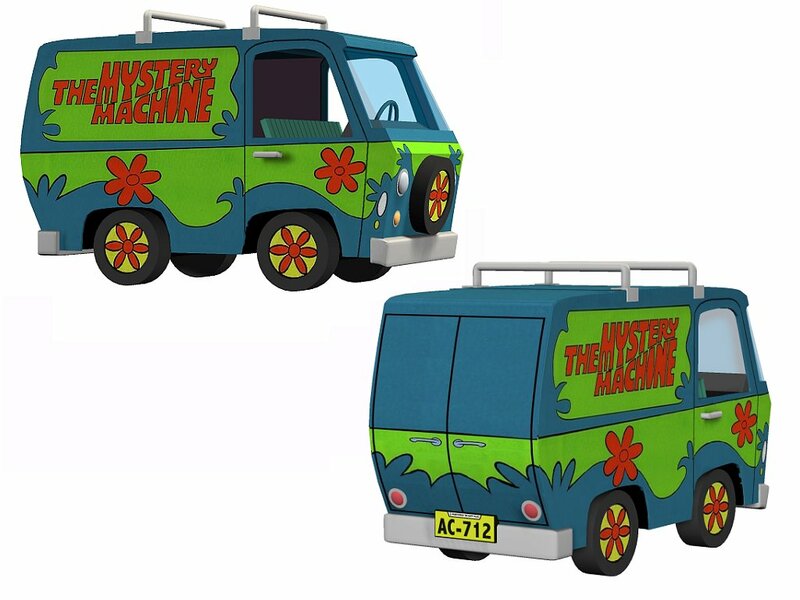 From the classic cartoon series Scooby Doo, here's the gangs van. 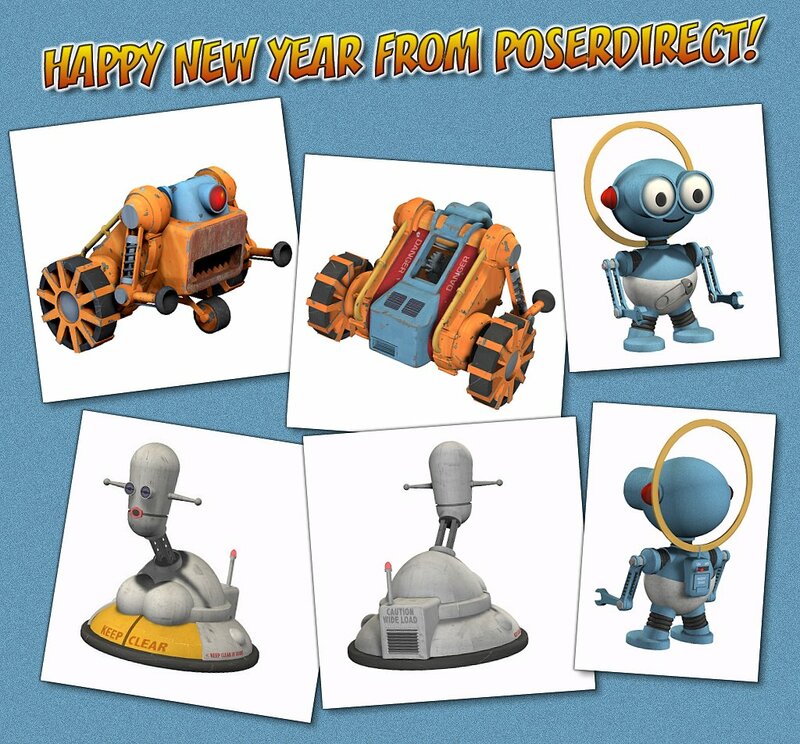 Poser .PP2 prop format with P4 based Materials, so should be OK in most 3d apps. Presented here as another example of the technique I'm developing, that can convert most 2D images into 3D models. UPDATED! - Now a figure with opening doors and turning spinning wheels! 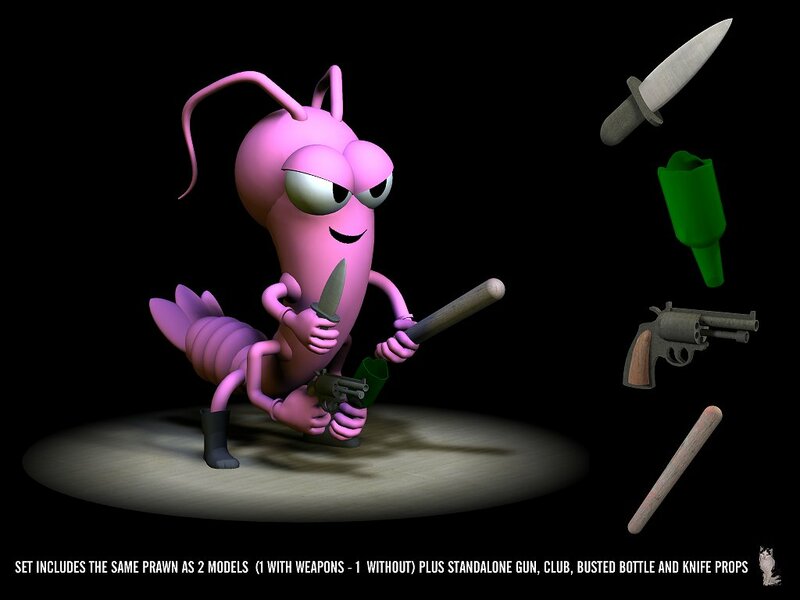 The original version of this 3D freebie was made of cardboard with a plastic gun. It was sold for a very short time in Europe (by Meccano), OZ and NZ (TolToys), Canada (Kenner) and in the UK (Palitoy), but never the USA. 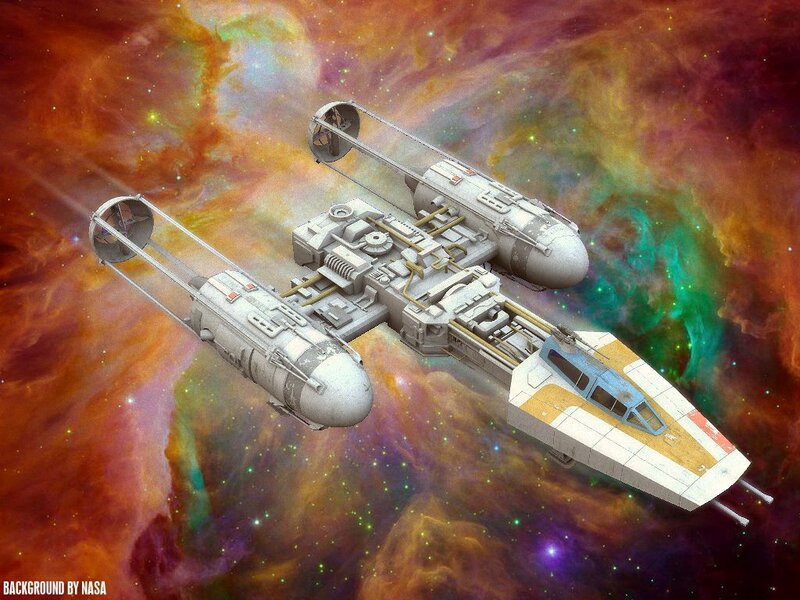 Over time it's become a Holy Grail amongst Star Wars collectors and an original will easily sell for over 500 quid (800 US Dollars). 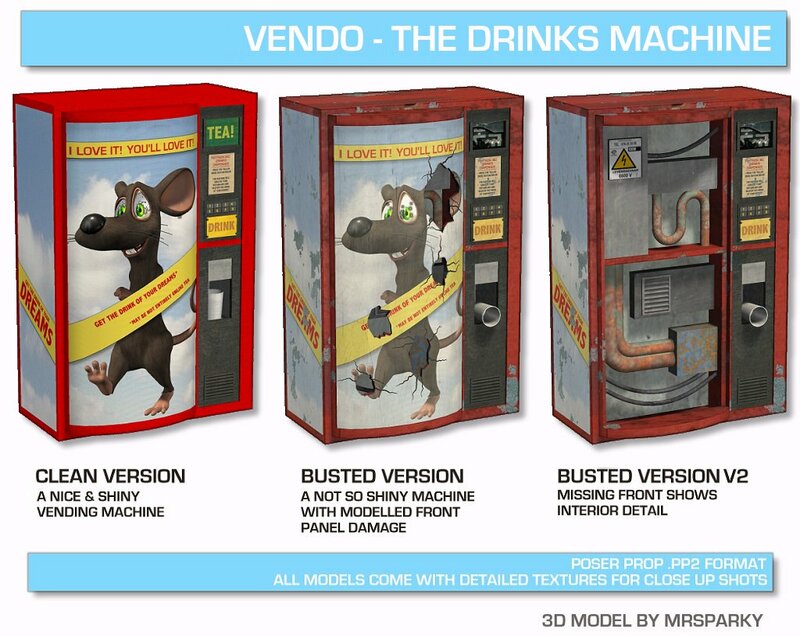 A detailed vending machine (from my Ruined City 2 product) in 3 flavours. Clean, Busted and Busted V2. 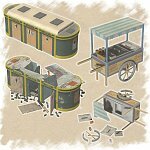 Plus bonus HHG2G "Nutrimatic Drinks Dispenser" texture set, which is unique to this version. Please view the large image to see the options in this set. The SE Vorg has been one of my most popular products to date, surviving at rendo for over 5 years. So I think it's time to release this one as a freebie to say thanks to everyone for supporting my work. Note: This one requires Robat's Cyber figure. Which is NOT included. 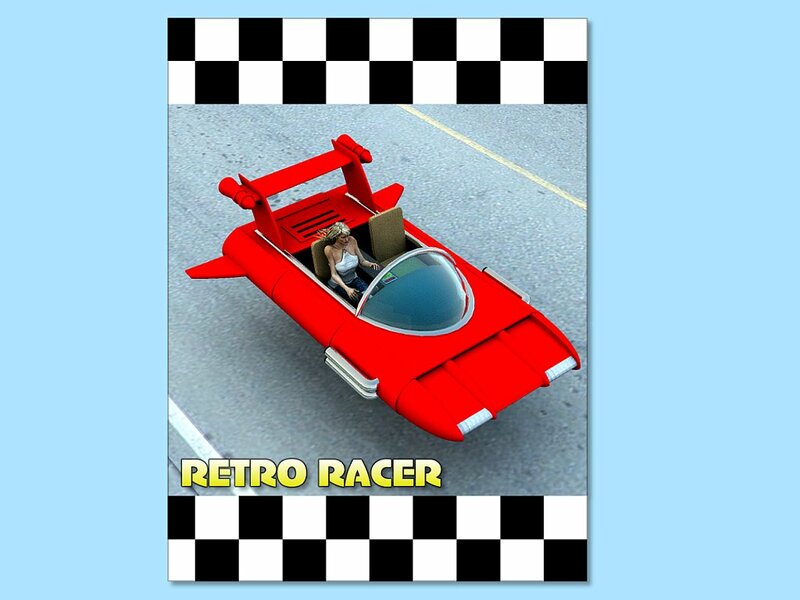 The Retro Racer is a small fun flying car with a nostalgic feel and 2 starter colour sets. With 2 seats and fully modelled controls, theres enough room in the rear for a servo droid and some suitcases. For best results read the readme first! Created by Thalek, this is a set of Reflective safety stripes for the VP/PD jumpsuits. It uses BagginsBill "lame" shader with modifications by EnglishBob. Poser 6 and Higher only. 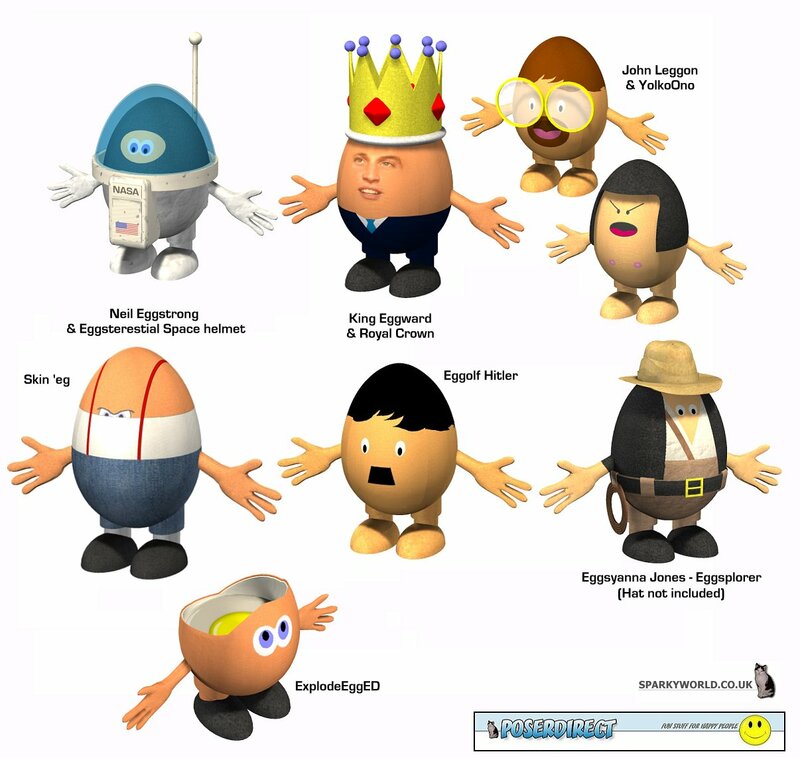 Plus texture templates for creating your own egg people. Based on photos and drawings published in newpapers, this is a mansion style building as found in Pakastain. The model comes in 3 flavours, each one is a poser prop. Full details in the read me. This freebie was originally commissoned by PReeder, who's kindly agreed to let these be shared. These small non-working prop bots are handy for filling sci-fi scenes. Inspired by the new and the orignal classic movies, heres a Tron like car. Please read the read me file to get the best results. Fed up with falling over in the snow ? Get these stylish and safe boots. To see the boots in action, click the thumbnail, and for the best results read the full instructions in the readme file. Click the thumbnail to see what this can do. 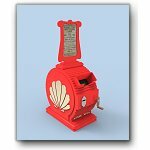 Raise a smile with this small, but fun Poser prop. A little addon for the minion, a fun little rocketship. Just light the blue touchpaper and let them fly! Inspired by the movie Dispicable Me, and rigged by Donnena, heres a minion for you. This is a Fan Arts freebie, so non commerical use only. 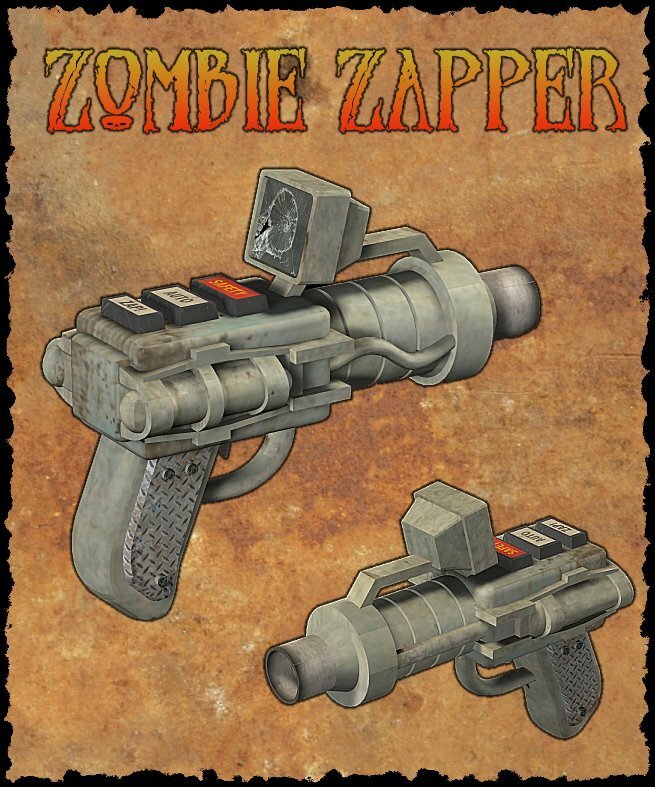 A Poser prop gun with video screen and 3 buttons. Also includes templates so you can make your own screen textures. Click on the thumbnail to see the modelled detailed. 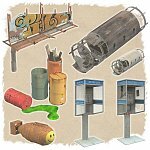 5 building props with high quality textures and modelled add-ons such as drain pipes and cables. All parented to a large ground base with telephone pole and warped pavements. Click on the thumbnail to see the details in this realistic free set. Please refer to the read me as this contains additional information. 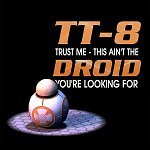 This file contains .BMP texture maps, MAT pose and instructions which allows you to easily create your own texture set for "Mr Sparky's Overlander - Modular Sci-Fi Truck". 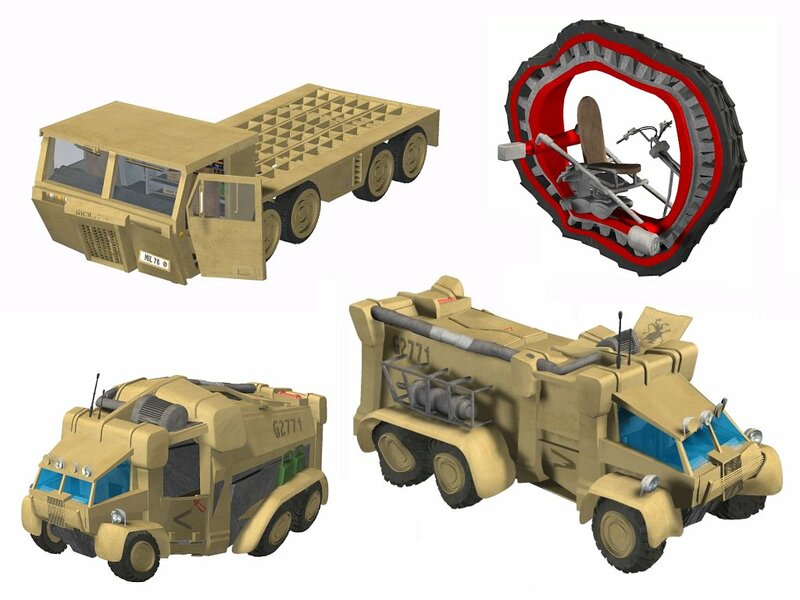 This set will NOT work on any other model and you MUST have The overlander model. 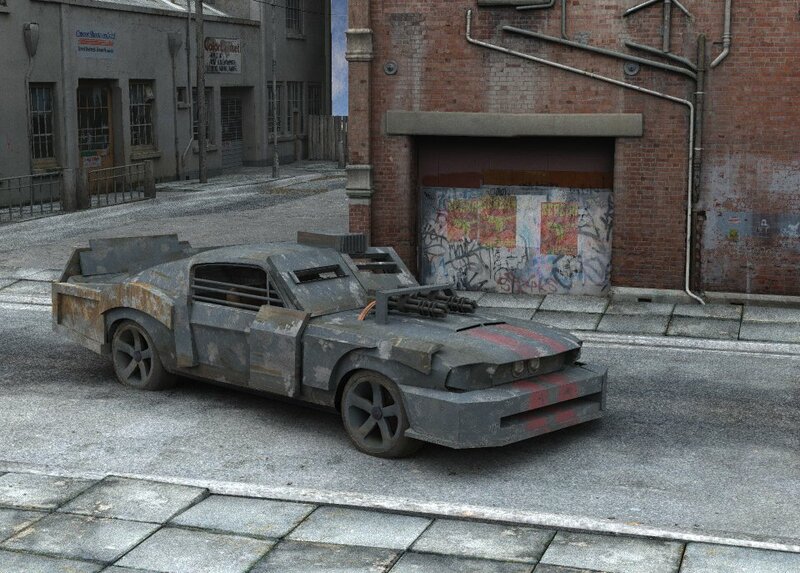 Inspired by the 2008 movie Death Race here is the Death Racer. Please refer to the read me for additional information. The DSU is a prop and freebie .PDF tutorial designed to enable Vue Artists to use their own photographs within Vue. View the sample image to see what's possible. Simple household boiler, made for Ralph in the daz forums. Contains 1 figure, 1 white texture set and 2 mat poses [White and MY MAP's]. This file has been lost, if you have a copy please let me know. 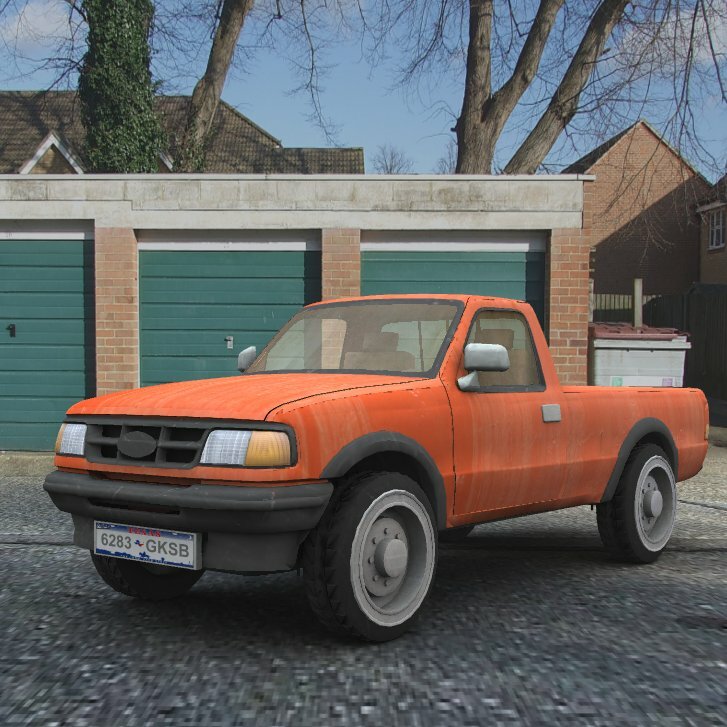 A pickup with various working features including opening doors and tailgate. The bonnet can open to display a mid detailed engine with modelled details such as wires, battery water bottle and VIN Plate. The interior contains 2 seats, console and a steering wheel that can turn. Plus all 4 wheels can rotate and the front 2 wheels can turn. Very basic gift bag created in response to thread at daz forums. No morphs. 2 textures. 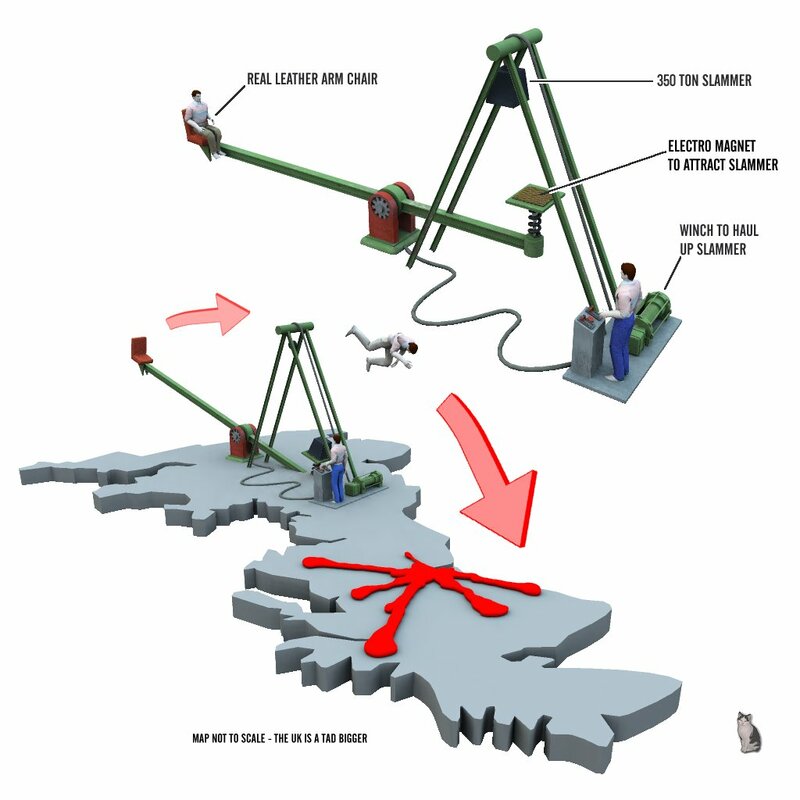 Model provided as is under GPL licence. Plus there's also a MY MAPS MAT pose - an easy to use system which allows you to easily make your own textures. Inspired by the tutorial by Johnny Duddle in the March 2009 issue of Computer Arts Projects, here is a fun 1950's styled sci-fi robot called the DudBot. Comes with loads of fun features, just read the readme to find out more.